Brazil, known officially as the Federative Republic of Brazil, is the largest country in both South America and the Latin American region. It is the world’s fifth largest country, both by geographical area and by population and is the largest Portuguese-speaking country in the world. 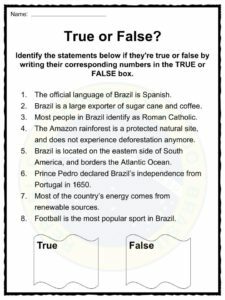 See the fact file below for more information about Brazil or download the comprehensive worksheet pack which contains over 10 worksheets and can be used in the classroom or homeschooling environment. 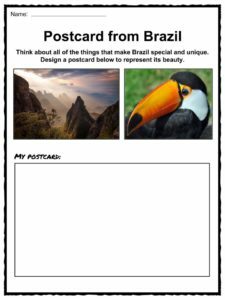 Brazil is a megadiverse country. It is home to many tribal nations. Brazil is a member of the United Nations, the G20, and is the world’s largest producer of coffee, and has been for over 150 years. When the Portuguese colonized Brazil, there were approximately 7 million indigenous people living in the territory. Many of these indigenous peoples were hunter-gatherers and lived a semi-nomadic life. The Portuguese claimed Brazil for the empire on April 22, 1500, and the first settlement was established 32 years later. Brazil was divided into 15 distinct colonies in 1534. By the mid 1500s, Brazil was exporting a large amount of sugar cane, and slaves became a major import in order to keep up with the demand for sugar cane. The Brazilian gold rush happened near the end of the 17th century. The Kingdom of Brazil was founded in 1821, after the Pernambucan Revolt in 1817, and after royal Portuguese family members returned to Portugal. Prince Pedro, the son of Prince Regent Joao, declared Brazil independent from Portugal on September 7, 1822, and shortly after, he was declared the first Emperor of Brazil. Brazil remained neutral in World War II, until 1942 when they entered on the allied side. In 1960, Brasilia became the capital of Brazil. Brazil has suffered from years of political instability and corruption. Lawmakers, ministers, and police officers have been accused of corruption, inefficiencies, tax evasion, and bribery, which has added to Brazil’s tense political landscape. Brazil is located on the eastern side of South America, bordering the Atlantic Ocean. It shares a border with all other South American country except Chile and Ecuador. Brazil is the 5th largest country in the world and spans 4 time zones. It is the only country with both the Tropic of Cancer and the Tropic of Capricorn running through it. The topographic makeup of Brazil is varied, and includes scrublands, mountains, plains, and hills. All of Brazil’s rivers drain into the Atlantic, including the Amazon river. Most of Brazil is a tropical climate, although the country has a wide range of weather conditions. 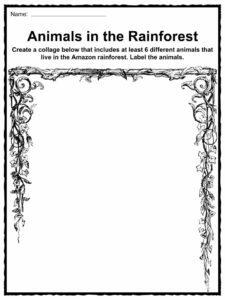 The Amazon rainforest, in northern Brazil, has the greatest biological diversity in the world. There is an abundance of wildlife in Brazil, with the number of plant and animal species in the country expected to reach 4 million. Some animals that live in Brazil include jaguars, sloths, armadillos, pumas, piranha, and many others. Increased deforestation and cattle ranching threaten the natural and diverse landscape of Brazil. 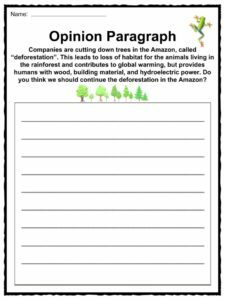 Logging, mining, gas extraction, and climatechange also threaten the country’s beauty, and the habitats of many species of animals and plants. Brazil has a mixed economy with lots of natural resources at its disposal. Brazil exports cars, textiles, footwear, orange juice, and many other products worldwide, which contributes significantly to the economy. Much of Brazil’s energy comes from renewable sources, including hydroelectricity and ethanol. Brazil has a thriving tourism sector, which grows slightly each year. Many tourists visit Brazil to see the natural areas, including the various beaches, dunes, and the Amazon rainforest. 73% of Brazil’s oil reserves are found in deep water. Nearly half of the population of Brazil are white, and around 44% of people identify as Pardo. The majority of people in Brazil identify as Roman Catholic. Portuguese culture strongly influences the Brazilian culture. Brazilian art and architecture is very eclectic, and draws on influences from the Baroque period and European styles. 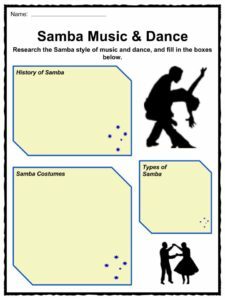 Samba and Choro are very popular musical styles; The Rio Carnival is a yearly festival held in Rio de Janeiro that is filled with floats, samba displays, music, and bright colours. The cuisine in Brazil varies by region, but popular dishes include Feijoada, moqueca, polenta, and of course, coffee and liquor drinks. Football is the most popular sport in Brazil, but volleyball, basketball, auto racing, and martial arts are also very popular. 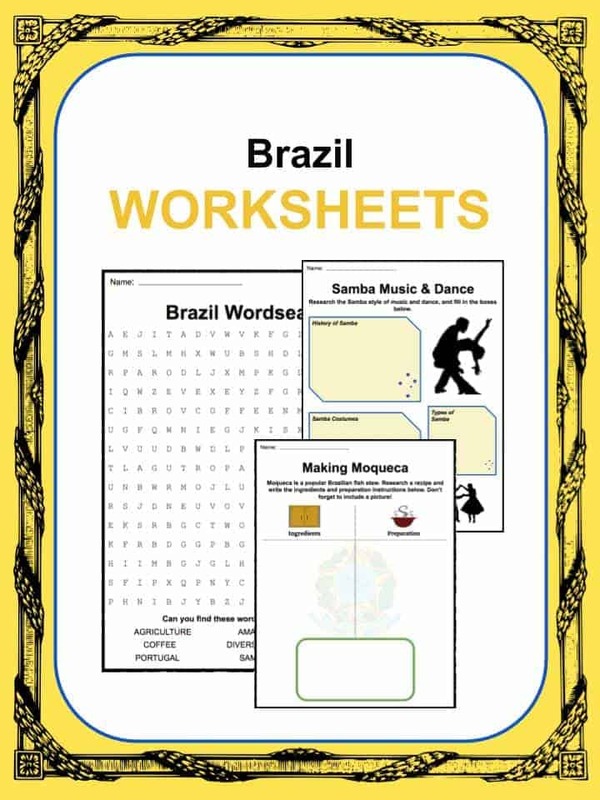 This bundle contains 11 ready-to-use Brazil Worksheets that are perfect for students who want to learn more about Brazil, known officially as the Federative Republic of Brazil, which is the largest country in both South America and the Latin American region. 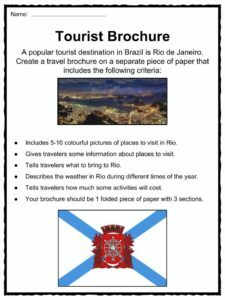 It is the world’s fifth largest country, both by geographical area and by population and is the largest Portuguese-speaking country in the world.